A study that received funding from the Leopold Center demonstrated that including small grains, such as the oats pictured here in 2016, in field rotations can reduce the need for chemical inputs. The Iowa Legislature created the Leopold Center for Sustainable Agriculture in 1987. Housed at Iowa State University, its mission is to improve the environmental impact of agriculture in ways that still allow farmers to earn a living. The Legislature recently decided to defund the research center, leaving it to rely on money from its existing endowment, grants it can procure, and whatever support Iowa State chooses to provide. Ferd Hoefner, now a senior advisor at the National Sustainable Agriculture Coalition, says the Leopold Center is one of the top institutions supporting research on agricultural techniques that prioritize sustainability and conservation in the context of profitable farming. When he was working with Congress in the late 1980s to draft the bill that created the U.S. Department of Agriculture’s sustainable agriculture program, Hoefner says the Leopold Center served as a model. “I remember reviewing the Iowa law to get ideas on how to formulate the federal program,” Hoefner says. Hoefner says following the Leopold Center’s leadership, several dozen additional states, including Wisconsin, Minnesota, Kentucky and Kansas, created similar groups. 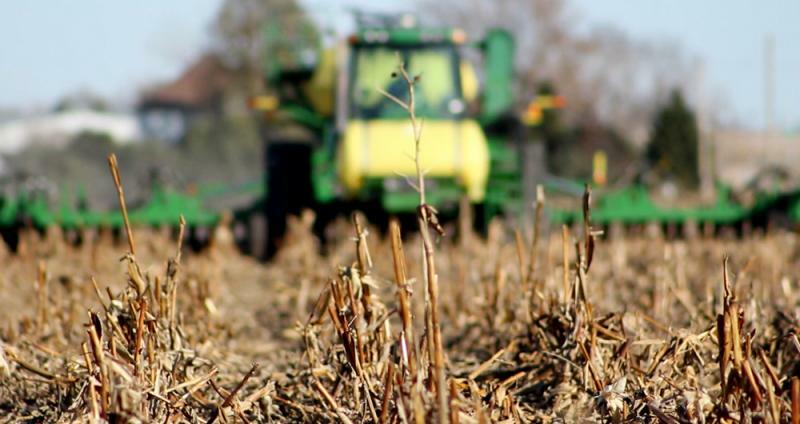 Research from the Leopold Center has identified successful conservation practices, which can also be used in other states, that can keep nutrients on fields, prevent soil erosion, and help clean up water. It is also a pioneer in studying how local food systems can be successful. 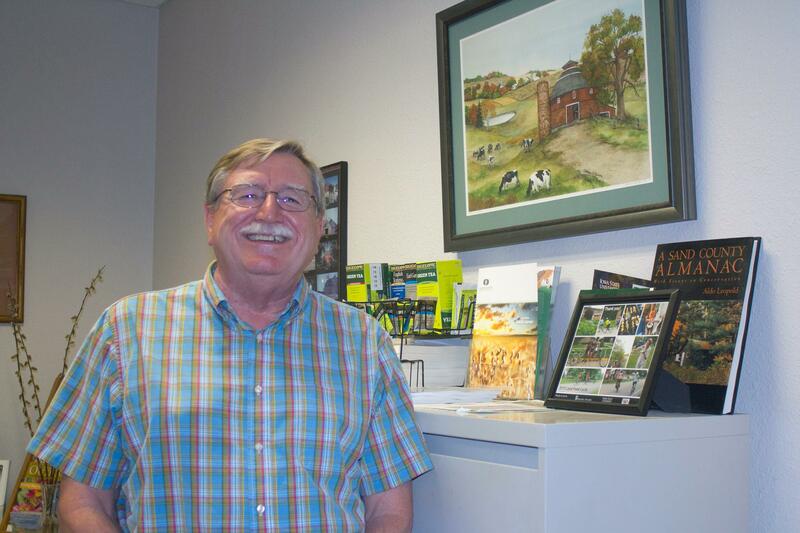 Director of the Leopold Center for Sustainable Agriculture Mark Rasmussen in his office at Iowa State University. That means the ubiquity of farmers markets, the creation of regional food hubs, and the notion that you should know your farmer or buy fresh, local produce all owe a little debt to the Leopold Center. Hoefner finds it perplexing that today the state Legislature would forfeit that leadership role, and no longer commit to funding sustainable Ag research. “It boggles the mind, really,” he says. This spring, however, the Republican-controlled Iowa Legislature passed two measures, one to defund the center and one to eliminate it. State Sen. Rita Hart, a Democrat from eastern Iowa who farms with her husband and serves on the agriculture committee, says the move came amid an ongoing and bitter struggle over agriculture’s contribution to water pollution in one of the most farm-heavy states. Hart says to the contrary, everyone involved with agriculture seems to agree on several ongoing, vexing problems. The most high profile among those: improving water quality. Solving them, she says, will benefit everyone. Taking aim at the research center seemed to further drive a wedge between rural and urban residents, she says, and that is the wrong way to approach large-scale problems. 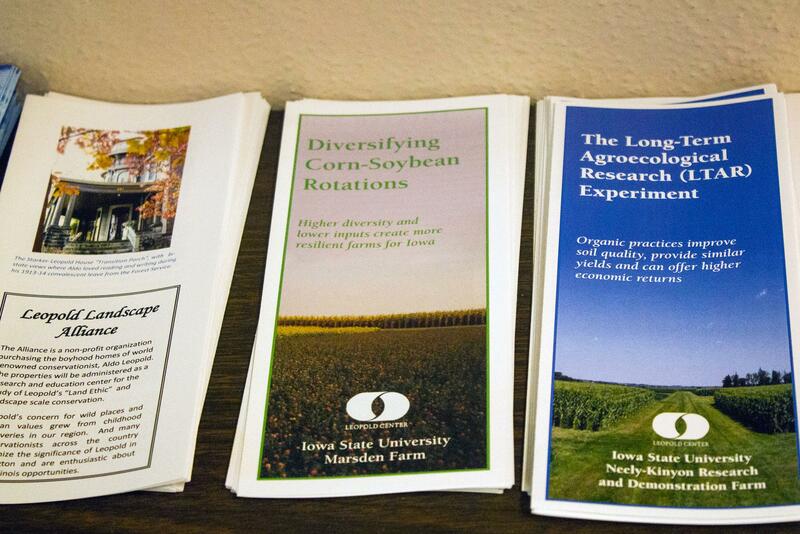 Outside its offices in the same building that houses the Monsanto Student Services Wing and other agriculture industry-funded spaces, the Leopold Center displays some of its research results. Ultimately, Republican Gov. Terry Branstad, who signed the original law creating the Leopold Center, wielded his line-item veto power to spare it. (It will be one of Branstad’s last acts as governor; he is poised to become U.S. ambassador to China.) Leopold Center director Mark Rasmussen witnessed an outpouring of support for the research even as the center’s future awaited the governor’s decision. “I just would express some gratitude that he did agree to keep the center alive for another day,” Rasmussen says. The Leopold Center takes its name from the Iowa conservationist and writer Aldo Leopold. Each year, Ames, Iowa, residents inspired by Leopold’s work gather to read it aloud. The center’s first director, Dennis Keeney, attended this year’s event as the future of the center still hung in the balance. Keeney says Leopold’s writings from the 1940s about the conflict between development and conservation continue to resonate today. Keeney says money is important, but it also matters who gets it. The funding that once fueled broad, diverse research at the Leopold Center will now flow to the Iowa Nutrient Research Center. Powerful agricultural interests see that as less threatening to how they do business, Keeney says. “They know if they put money in the Nutrient Center nothing will happen that will really lead to regulation,” Keeney says. The Iowa Nutrient Research Center is tied to a voluntary state plan to reduce runoff of farm chemicals into waterways. For other sustainability questions, farmers from around the country will now have to turn to different sources. Ferd Hoefner of the National Sustainable Agriculture Coalition, however, says the movement the Leopold Center helped inspired will continue its work.